In Kierkegaard and Modern European Philosophy: An Introduction Michael Weston argues that, despite being acknowledged as a precursor to Nietzsche and post-Nietzschean thinkers such as Heidegger and Derrida, the radical nature of Kierkegaard's critique of philosophy has been missed. Weston examines and explains the metaphysical tradition, as exemplified by Plato and Hegel, and the post-metaphysical critiques of Nietzsche, Heidegger and Derrida. He shows how Kierkegaard's ethical critique of philosophy undermines the former and escapes the latter. He considers another ethical critique of philosophy, that of Levinas, before identifying ethics as the non-philosophical site where philosophy can be criticised. 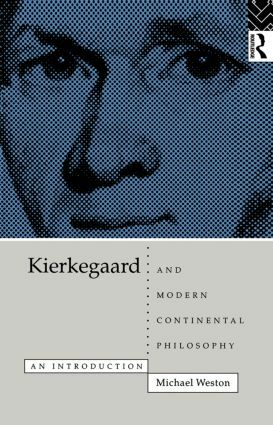 Kierkegaard and Modern European Philosophy: An Introduction argues that, by refusing to allow philosophy jurisdiction over ethics and religion, Kieregaard's critique applies as much to modern continental thought as to the metaphysical thought it seeks to undermine.